As the leading manufacturer of indoor rowing tanks, we have been designing, installing, and servicing indoor rowing tanks for over 27 years. These facilities once used primarily used for off-season rowing, muscle-specific conditioning and technique training have become full year training facilities, where the instantaneous feedback of force and other related curves are beneficial in teaching proper technique and muscle-specific action at a full range of power intensities. 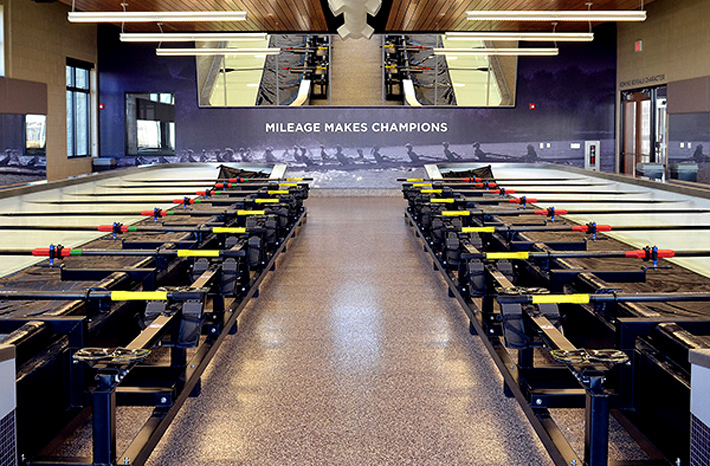 Presently, we have installed 39 indoor rowing facilities of various sizes (2 to 16 stations) for universities, schools, fitness centers, club rowing/sculling programs and National Training Centers. The last three tanks have been ordered with force measurement instrumentation. In addition to steady-state, anaerobic-threshold, and transportation workouts can be done in the tank with rates above thirty stroke per minute. The function of most indoor rowing tanks is to instruct novices, providing a platform for demonstrating appropriate technique and steady–state rowing. However, with our present tank design, athletes can use the tanks for most all workouts, except high intensity 1 min pieces and starts. Most updates can be readily retrofitted to any of our existing tanks. The Dreher Rowing Tank design exceeds the performance of powered tanks, at a fraction of the cost, while also being the most environmentally friendly indoor rowing tank design! We also provide tank specific rowing component, additions, or replacements to older tanks to provide the latest functionality of what we currently sell and can refurbish older tanks. Recent tank enhancements allow customers to select from a wide range of configurations and rigging options to achieve a greater range of stroke rate options. In the development of the Dreher Indoor Rowing Tank, we closely examined flow technology and loading profiles from both powered and non-mechanically assisted rowing tanks. Our analysis demonstrated that an athlete-powered tank design provides a superior simulation of the force levels and handle velocity experienced in the boat. Powered tanks, on the other hand, have a large mass of water moving that travel at a constant velocity and as a result, prevent the rowers from executing the drive similar to that of the boat. During the drive phase, in the boat, the rower accelerates the handle to the finish due to the boat increasing speed from the catch to finish. Replicating the stroke profile should be a primary concern for an indoor rowing tank. Just as in the boat, in the Dreher “athlete powered” tank, the rowers are the engine. The better the technique, strength, fitness level and synergy of the athletes, the higher the achievable stroke rate and efficiency. With the load matched more closely to what is seen in the boat, the acceleration to the finish is possible. The water is more responsive to the athletes’ power input, which makes the Dreher Indoor Rowing Tank the only truly dynamic rowing tank from the catch to the finish. Optimization of fluid flow, minimizing total volume, and proportioning outboard lever and blade size, allows our design to only require a fraction of the water volume of other tank designs.